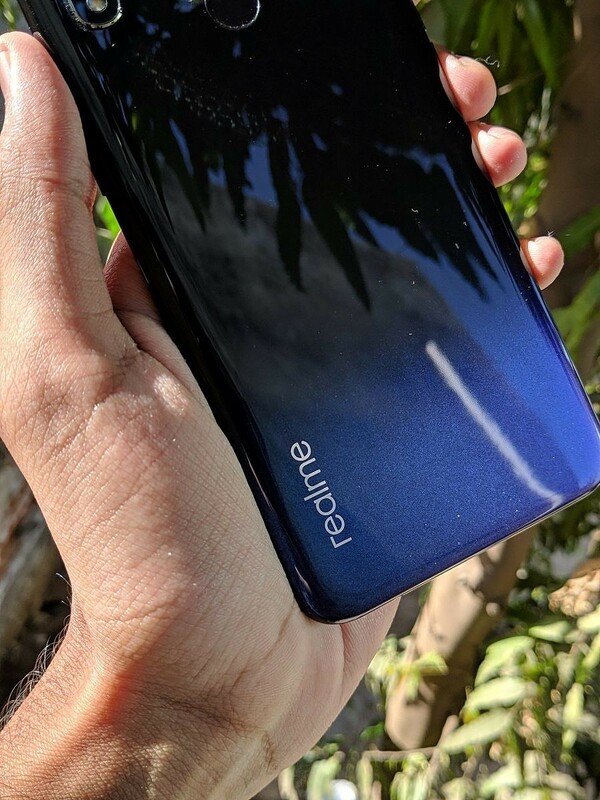 Since its inception as a sub-brand of Oppo, Realme has been churning out some really interesting devices with attractive designs and very competitive prices. Devices such the Realme 1 and Realme 2 Pro attracted many, giving Xiaomi’s Redmi lineup a run for their money. The new Realme 3, which launched earlier this month, is yet another compelling device from the year-old company. The successor to last year’s Realme 2, the new device brings some interesting upgrades, including a new design and a more powerful chipset. The screen resolution, battery size, and camera sensors remain the same. With a starting price of just RS. 8,999 ($131), the Realme 3 claims to offer the best budget smartphone experience, but does it live by its promises? Find out in this review. CPU MediaTek Helio P70 @2.1GHZ – 4x Cortex-A73, 4x Cortex-A53). Audio 3.5mm headphone jack, Dirac HD sound. Design isn’t one of the strongest points of budget smartphones for obvious reasons. The Realme 3 breaks this norm by offering a stunning unibody design that’s not indicative of its price point in any way. The unibody design is made of injection molded plastic, which feels soft to touch and looks quite premium. There is no mid-frame separating the back and the display component, giving the device a sense of seamlessness. It’s hard to believe by looking at the Realme 3 that such a stunning design can be achieved without any use of metal or glass. The seamless look is accompanied by beautiful gradient colors. The device comes in two colors: Dynamic Black, which we are reviewing, and Radiant Blue. The gradient effect is achieved by overlapping two layers of black and blue ink. When you rotate the device under lighting from a certain angle, you can see the lower back changing color from blue to purple. Realme says it takes 3 rounds of spraying and 8 spray guns to achieve this effect. The glossy finish really adds to the visual appeal of the device, though good luck maintaining a clean back. The shiny back gets clouded with fingerprints and smudges in no time. You’ll have to regularly wipe it with a soft cloth to maintain a clean look – or you can put on the transparent hard case which comes inside the box. Fortunately, the device isn’t that slippery despite the glossy finish and provides a firm yet comfortable grip and easy one-handed handling. The front of the device is mostly covered with a display with super slim side bezels and a smaller chin. The Gorilla Glass 3 protection is onboard and as an extra step of precaution, the device also comes with a factory applied screen protector on top. The Realme 3 does away with an iPhone-like cutout of its predecessor and instead opts for a water-drop notch. The notch houses a front camera sensor and a proximity sensor. Just above the notch is the earpiece. On the back, we find a dual-camera setup, a fingerprint scanner and a vertically printed brand logo. All ports and holes are on the bottom – that includes a mono speaker, a micro USB port, two microphones, and a 3.5mm audio jack. Realme has taken a different approach in regards to the position of physical buttons. The right side only holds the power button while the volume keys are placed on the left side. The left also accommodates the SIM tray which can carry two nano-SIMs and a microSD card at the same time. Moving to the display, the Realme 3 offers a 6.2-inch HD+ panel which has an aspect ratio of 19:9. Although the resolution is on the lower side, the overall performance of the panel is quite satisfactory. The color reproduction is accurate, contrast and saturation are on point, and viewing angles are optimal as well if you keep the price point in mind. The display is calibrated to sRGB color space. We found the default color temperature to be on the cooler side, but thankfully this can be easily fixed by adjusting the temperature slider under the display settings. As is common with most custom skins nowadays, you also get a night mode – dubbed Night Shield – which tints the screen with a warm yellow tone and filters out harsh blues for a comfortable viewing experience at night. ColorOS offers further customizations with Night Shield for different use cases. So along with a basic night mode, you also get a black & white mode and a high contrast reading mode with white text on black background. Outdoor visibility is OK. You will be able to read the text under direct sunlight but viewing images or any other media isn’t a very pleasant experience as colors appear washed out and contrast faded. While we would have liked a Full HD panel the overall display performance is totally acceptable and one of the better we’ve seen in the segment. The stock camera app offers a no-frills experience. You can switch between video mode and portrait mode by swiping right and left, respectively. Toggles for flash, Chroma Boost, color filters, and settings are placed on the top layout. Further shooting modes such as Nightscape, manual, and slow-motion and time-laps are hidden under the hamburger menu. There’s also a tiny 2x zoom toggle which comes in handy when you quickly want to zoom in on subjects. 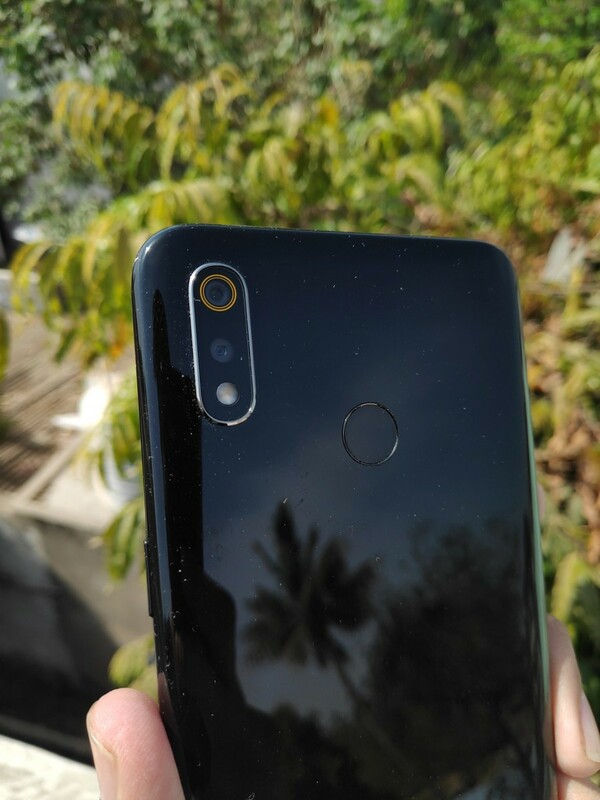 The Realme 3 is fitted with two cameras on the back. While the resolution is identical to its predecessor, the primary sensor now uses a brighter f/1.8 for better low-light performance. Most lower budget phones have become good enough nowadays that they have no trouble taking reasonably good shots in broad light daylight. Having a flagship still goes a long way in terms of dynamic range and detail retention, but the point is the quality gap isn’t what it used to be a few years ago and with each new generation of mid-rangers it’s closing down even more. 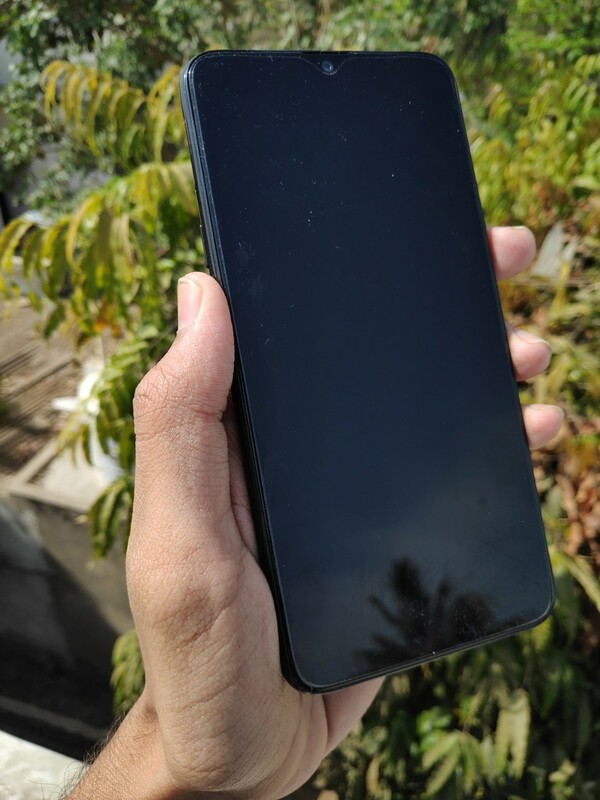 As far as daylight performance is concerned, the Realme 3 mostly delivers visually appealing results which seem to tie in with its “social media ready” pitch. There are adequate details in shots and colors are accurate as well. Images do suffer from the lack of natural dynamic range. Shooting with Auto HDR doesn’t seem to aid much either. It’s accurate at detecting high contrast scenes but in terms of improving shadow details, it’s far from effective. Shots taken with and without HDR show little difference. We also observed oversharpening and excessive saturation being applied to many of the images – probably in an attempt to make photos look more pleasant. To compensate for a limited dynamic range of the camera, Realme has included a dedicated shooting mode called Chrome Boost which claims to improve high contrast images with the help of software processing. Chroma Boost enhances colors, contrast, and saturation of the image and brings out a more vivid looking shot than what you would get from the standard shot. Results are far from natural but should be fine for sharing on places like Instagram. The low-light performance is passable. Images don’t retain many details, have a lot of noise, and appear a bit oversaturated. HDR does help lift up shadows a bit but the end results still leave a lot to be desired. 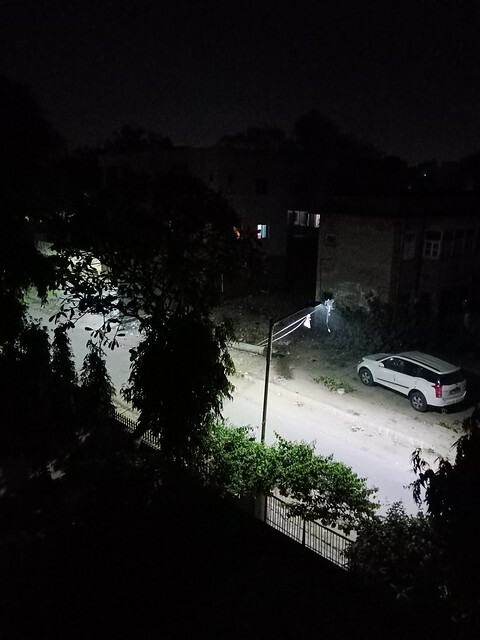 Interestingly, Realme has included a dedicated night shooting mode called Nightscape which the company claims greatly improves low-light and night shots. Nightscape works on the same principle as other night modes out there – it takes multiple long exposure shots at once and sticks them together to assemble a final image which is brighter and more detailed. Indeed Nightscape does make a noticeable difference in low-light scenes and brings out more details from darker areas. 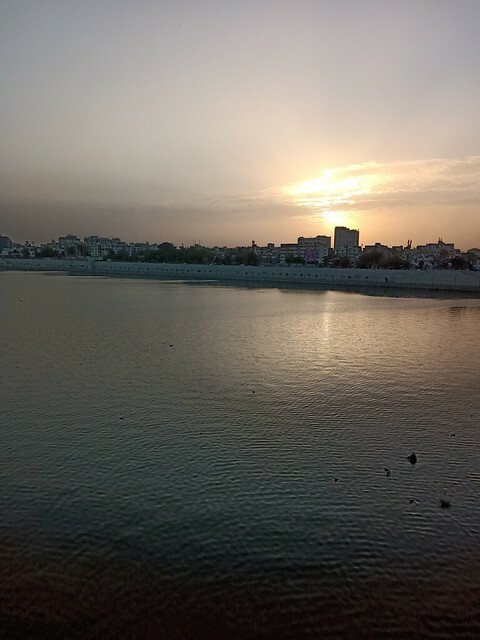 The effect isn’t as dramatic as what you would get from something like Google Pixel’s Night Sight but the fact that such functionality is available on a budget device like Realme 3 is itself quite impressive. Moving to the portraits, the portrait mode on the device is reasonably accurate in differentiating background and subject as long as the scenes aren’t too complex. It takes a little time to calculate depth information but the end results are on point most of the times. It’s not reliable under low-light conditions, but that’s an issue with almost all devices in this price range. The blur rendering is a bit heavy-handed so the images look a little unnatural. There’s no option to control the intensity of bokeh before or after you take a shot so you’re basically stuck with the default settings. For selfie needs, the device has a 13MP front camera. In well-lit conditions, images came out well with sufficient details and good contrast but the dynamic range is again sub-par. Noise levels are high in low-light shots and images appear grainy. We have seen devices like the Redmi Y2 offer much better selfie performance in this price range. 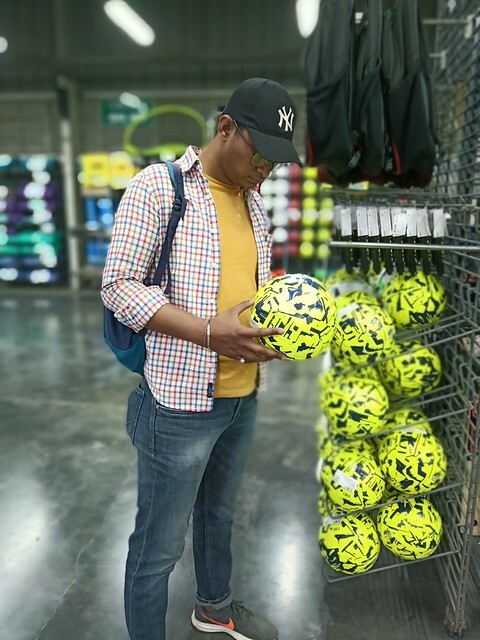 For casual photo taking and social media sharing, the cameras on the Realme 3 certainly won’t disappoint you. Nightscape is a nice perk to have and should help further differentiate the device from the competition. 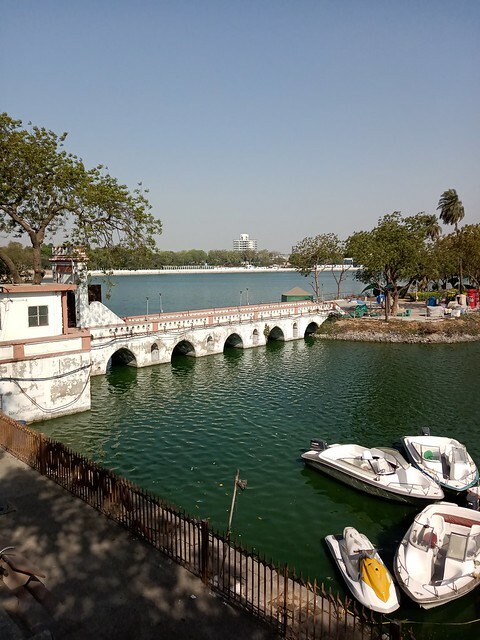 In terms of overall camera performance, the Realme 3 is a perfect example of Jack of All Trades. It does all things sufficiently well but it’s certainly not the best in class. Nothing deal breaker though considering the price point and the audience it’s aiming for. For those upgrading from an entry-level phone, camera performance is still a big step up and more than satisfactory to fulfill their requirements. However, If you’re looking for a device with capable camera performance, you’ll be well advised to take a look at offerings from competing OEMs which offer a far better camera performance. Powering the Realme 3 is the MediaTek Helio P70 octa-core chipset. Built on TSMC’s 12nm FinFET process, the chipset features 4x Cortex-A73 performance cores and 4x Cortex-A53 efficiency cores for handling lightweight activities. The Helio P70 is exclusive to the Indian market – elsewhere the device comes with a MediaTek Helio P60. It’s a step up from the Realme 2 which featured a Snapdragon 450 chipset. Sadly though, the impressive specs don’t translate to a fast and flawless performance in real life. The real world performance is quite underwhelming. Lagging and stuttering can be observed in many portions of the SystemUI. Even as mundane an activity as pulling and expanding notification shade shows noticeable stutters and freezing. One of the most frustrating things I’ve encountered is when the device is disconnected from the internet for a while and when you turn on the internet again, it becomes completely unresponsive. I just keep it aside and wait till the notifications and apps have been updated and there’s nothing more left to sync. App opening times are also slow compared to what we’ve seen on Xiaomi devices. As always, these performance glitches have nothing to do with chipset or MediaTek. In fact, the Helio P70 is one of the most powerful and capable SoCs in the mid-range segment. Realme’s marketing material is filled with how it’s comparable and, in some respect, even better than the Snapdragon 660 and that’s actually true. But in reality, the device’s real-life performance is not comparable to even devices running the Snapdragon 636. 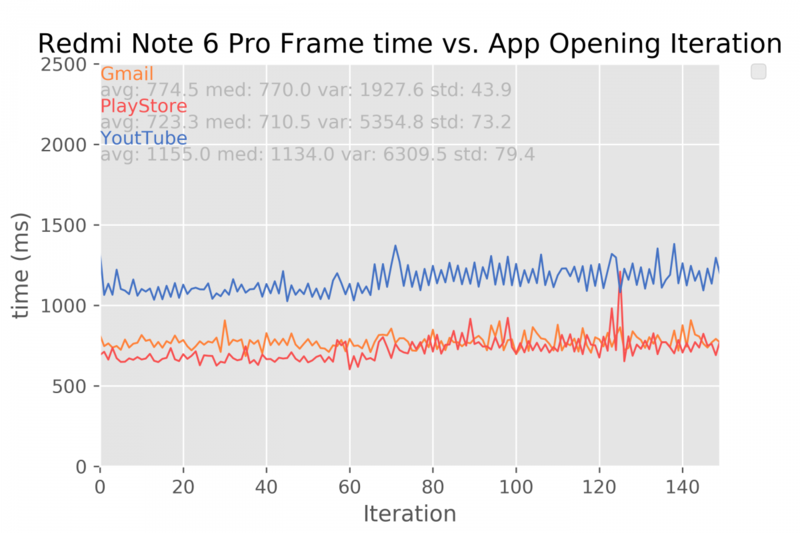 This isn’t to say performance is terrible to the point of being unusable. Outside of the aforementioned scenarios, the performance is quite manageable though far from ideal. Hopefully, this is something which can be improved in future updates. For this review, I’m choosing not to feature any benchmark numbers as I believe they will be quite misleading and don’t tell the true story of the device’s actual performance. 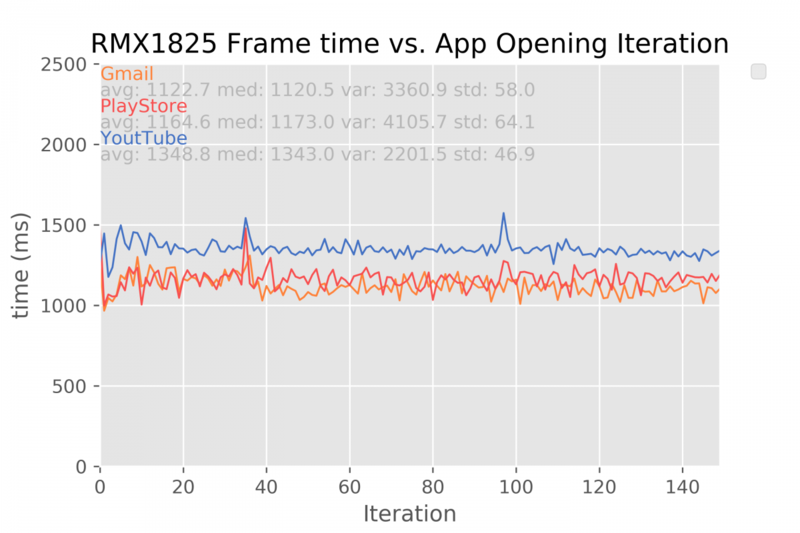 In our app opening speed test, which comprises of opening Gmail, Play Store, and YouTube in quick succession for 150 times for each app, the device turned out to be a slow performer. Memory management isn’t aggressive contrary to what I expected. Apps stay in memory for a long time and don’t get unexpectedly killed. During my test, the device was able to hold up to 11 apps in memory without any reloading when reopening them. ARM Mali-G72 MP3 is a big update over Snapdragon 450’s Adreno 506 on the Realme 2 and the difference is evident when playing games. It also helps that the device has a low-res 720p display which puts the device at an advantage as the GPU will have to render fewer pixels. We played multiple graphics-intensive titles to assess the gaming capabilities and found it be a pretty good contender especially considering its price point. First, we tested PUBG, which has became a benchmark for testing the graphics capabilities of any device. The game started off on medium graphics and was mostly smooth during our 15 minutes of gameplay. The mean framerate remained consistent at 26FPS throughout the session with impressive frame stability of 95%. In the second match, we ramp up the graphics to HD – the highest quality supported on the device – and FPS to the max setting. The gameplay wasn’t as smooth as it was in the first round but the overall gameplay was still enjoyable. The device maintained a framerate of 30FPS with frame stability of 92%. Next, we took EA’s Need for Speed Unlimited for a spin and the device had no issue hitting a steady framerate of 30fps throughout our 12-minute session. We also checked out some other titles such as Asphalt 8: Airborne, Alto’s Odyssey, and Dead Trigger 2, which the device had no trouble keeping smooth gameplay. The device does get hot around the back when playing – especially around the area surrounding the fingerprint scanner – but not to the point of being uncomfortable. Realme’s Gaming Assistant really comes handy when playing games. It helps get rid of pop-up notifications, sounds, as well as incoming calls for a distraction-free gaming experience. You can take screenshots and even record your gaming session with a single click. It also allows you to open WhatsApp and SMS app in a small pop-up window so you can chat with your gaming buddies right from the game screen without actually leaving the game. 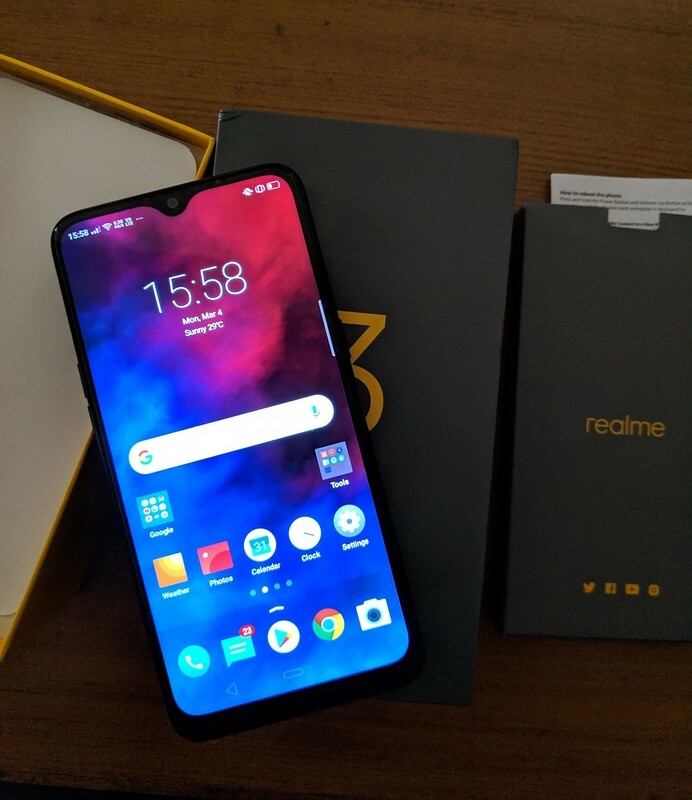 On the software side of things, the Realme 3 is shipping with Android Pie with the latest version of the company’s custom UI on top. ColorOS 6 brings many new changes and visual overhauls over previous versions. In terms of design, the new UI uses white backgrounds with subtle gradient colors for a clean appearance. Oppo says they have removed lines and spacing from the menus and settings to allow for a more intuitive and faster navigation experience. System app icons have been redesigned as well and they now feature a circular design with a bright color scheme. One of the biggest changes the new UI brings is the addition of an app drawer to the default launcher. If you prefer the old iOS-style interface you still have the option to switch to the standard mode and have all your apps organized on the home screen. In terms of bloatware, the device doesn’t come installed with a whole lot. A couple of apps which come preinstalled include UC Browser, Facebook, Daily Hunt, and Webnovel, and they can be easily uninstalled. Sounds and alerts can be controlled with the standard Mute mode and there’s also a more granular Do Not Disturb mode which is equivalent to what you get on stock Android. Another big change in the newer version is the Android P-style navigation system. Similar to Google’s implementation, the home button acts as a movable pill which can be dragged to either side to scroll through the recent apps screen. A swipe up and hold opens the recent window which displays opened apps in rounded cards. You can drag the home button either side to scroll through the recent apps screen while a simple drag and release to the left takes you to the last used apps. You can also opt for iOS-style swipe up navigation gestures to utilize maximum real screen estate. Swiping up from the right and left acts as a back button and a swipe up from the center gets you back to your home screen. Don’t want to deal with buttons or gestures altogether? There’s one more option for navigation in the form of Assistive Ball – a little bubble which acts as a floating navigation bar. A single tap on the ball acts as a back action, a long press takes you back to the home screen and double tap opens recent apps screen. Then there are off-screen gestures which allow you to perform quick actions when the screen is off. For instance, you can draw a V on the screen to turn on the flashlight or draw O to launch the camera app. It also allows you to create your own custom gestures and then tie it with your choice of action. For safer driving experience, ColorOS is also including a dedicated Riding Mode which mutes all notifications and sounds while you’re driving. You can whitelist contacts which you don’t want to mute or can use the “Ring for repeated calls” feature which let the device ring if the same number tries to call again within 3 minutes. Game Space is a central hub for gamers. It makes it easier to access your installed games by organizing them in one space. There are multiple tools to enhance and take control of your gaming experience. You can block notifications and calls so you don’t get interrupted in the middle of your game. Similar tools are offered by OEMs like Samsung and OnePlus on their devices so this isn’t something entirely new. Nevertheless, it’s nice to have such controls on a device like Realme 3. While I’ve no issue with the overall design and looks of ColorOS, there are some things which make the experience less than ideal. For example, If you want to use a custom launcher like Nova, ColorOS doesn’t easily allow you to set it as your default launcher – After you install a new launcher, pressing the home button takes you directly to the default system launcher with no dialogue box for selection. You’ll have to dig deep into app settings to choose your newly installed launcher. Customization is a very essential part of what makes Android a great platform and for a UI whose main focus is to offer more customization and controls over stock Android, this totally seems counterintuitive. Another inconvenience I experienced is with the lack of progress bar for downloads which makes it hard to keep track of your ongoing downloads. You have to open the download manager each time you want to check the download progress which normally can easily be glanced from the notification bar. ColorOS also lacks detailed battery usage stats. Details like the total screen on time and battery graph are not given. Hopefully, this will be addressed in a future update. ColorOS 6 seems to be a step in the right direction as it addresses many of the sore points of previous versions. But In terms of refinement and smoothness, it still has a long way to go before it can match the likes of MIUI and EMUI. If you can withstand some annoyances, ColorOS is actually not that bad of a skin. Personally speaking, it doesn’t appeal to me for aesthetic reasons, but for someone who cares about customizations and extra features, it has a lot to offer and can be a whole lot of fun. The rear-mounted fingerprint is well-positioned and can be easily reached without adjusting your hand grip. In terms of speed and accuracy though it’s a big disappointment. Majority of times it just fails to match my fingerprint. It was functional during the initial phase but over time it became totally unusable. No matter how carefully I try to position my finger, most of the time I’m greeted with “Fingerprint failed to match” message. Adding different fingerprints, removing and re-adding all over again didn’t help in any way. On the positive side, the face unlock on the Realme is really fast and accurate. Unless it’s totally dark, it almost never fails. Now, It doesn’t quite come close to IR face unlock on our Poco F1 unit but it’s reliable enough that I rarely had to fall back on PIN or fingerprint scanner to get into the device. The battery department is where the Realme 3 really shines. The 4230 mAh battery is not only slightly bigger than what competing devices are offering, but the low-res display also contributes to longer battery life. The Realme 3 clearly has an edge over the competition in this area and I’m quite impressed with the battery life I was getting during my review period. With a full charge, the device was able to get me through 2 full days on normal usage with still some battery juice left on the third day. My typical usage falls on the heavy side and involves a lot of web browsing, photo taking, and a heavy dose of social media apps. I’m not much of a gamer and outside of gaming tests, I didn’t use the device for any heavy gaming – your mileage may vary depending on your usage patterns. Charging times are on the slower side. This is to be expected when you take into account the battery size and the 5V / 2A charger. With the standard charger, the device takes close to 3 hours to fully charge from dead. Since the battery backup itself is quite amazing I don’t think this is a big issue. It would be too much to expect from a budget smartphone to supply a fast charger. On our standard PCMark Battery 2.0 test, the device managed to survive for 7hr and 19 minutes with brightness set to max, which is one of the highest we’ve seen for any device. The same test performed with brightness set to 50% saw device posting upwards of 13 hours of battery life. The Realme 3 has a single bottom firing speaker at its disposal. For a mono setup, the speaker gets reasonably loud though sounds start distorting at high volumes. The audio quality is about average and what you expect from a budget smartphone. Call quality isn’t crisp – caller’s voices start to get muffled on max volumes and the loudness is also on the lower side. Cell reception was good both indoors and outdoors, but we observed the cellular data speeds especially the downloading speeds to be slower than what we’ve seen in the segment. The Realme 3 has its strengths and weaknesses. Strengths include a beautiful design, a great battery life, a feature-rich camera experience, and good gaming capabilities. The performance isn’t up to par and software feels like it could use some polishing. But when we consider its price, the whole package isn’t that bad. The Realme 3 seems like a perfect fit for people who are upgrading from an entry-level smartphone but aren’t ready to spend on a proper mid-range device. 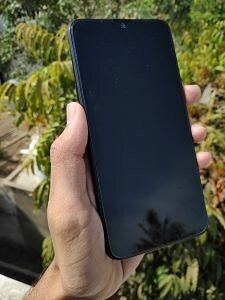 As much as we’re ready to grant the weaknesses of the Realme 3 for its low price point, the presence of the Xiaomi Redmi Note 7 prevents us from doing so. For a small price increase, the Redmi Note 7 offers far more value of money and future proofing which the Realme 3 just can’t match. 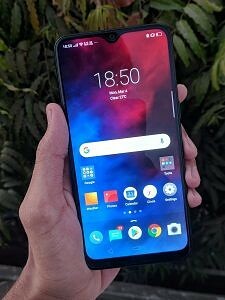 The Redmi Note 7 has a high-res display, a far better camera package (if the Redmi Note 6 Pro is any indication), superior performance, a more refined software experience, the list goes on. 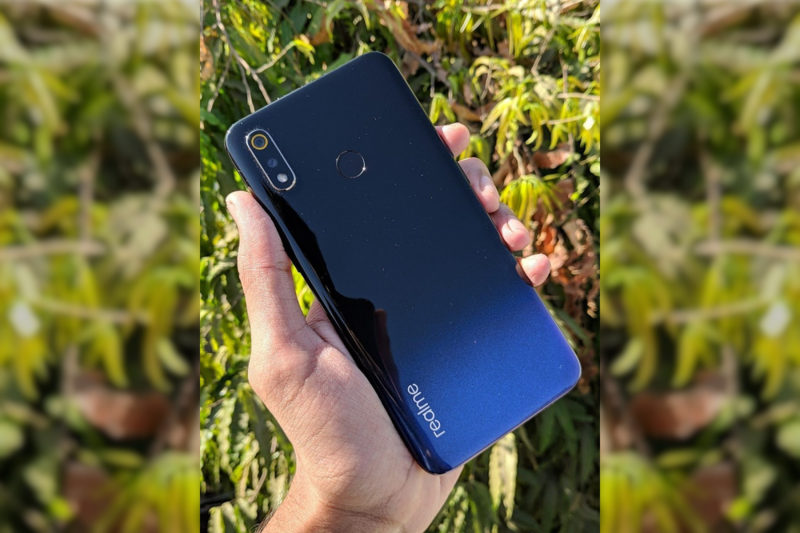 If you’re really tight on budget, the Realme 3 still has a lot to offer, but the Redmi Note 7 is just so much better in all areas that you will be missing out on a lot of things. 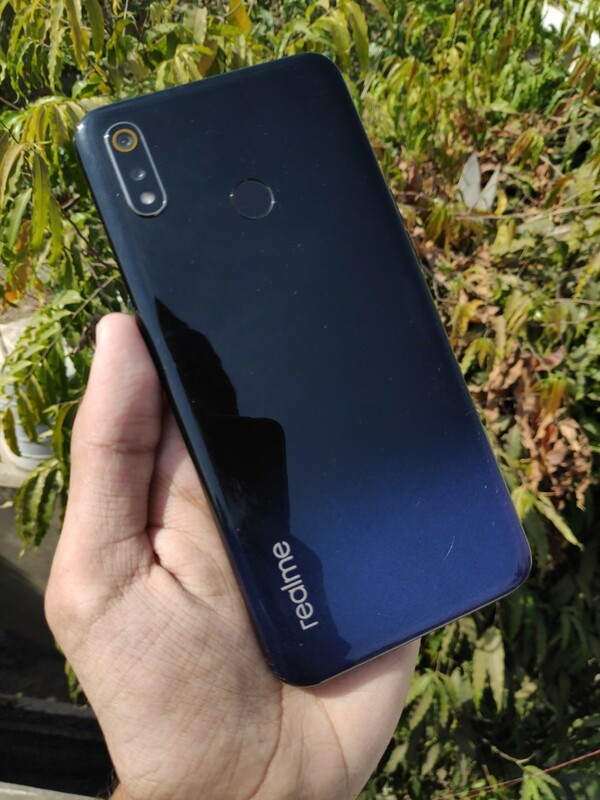 Realme says they plan to launch a Pro version of the device later this month which will go head to head against the current mid-range champion that is the Redmi Note 7 Pro. There’s not much known about the device yet but Realme says it’ll be “a beast and speed racer”. When the Realme 3 Pro launches, we’ll be sure to bring you a detailed review including in-depth performance analysis. As it stands, going with the Redmi Note 7 seems like a more sensible choice in our opinion. 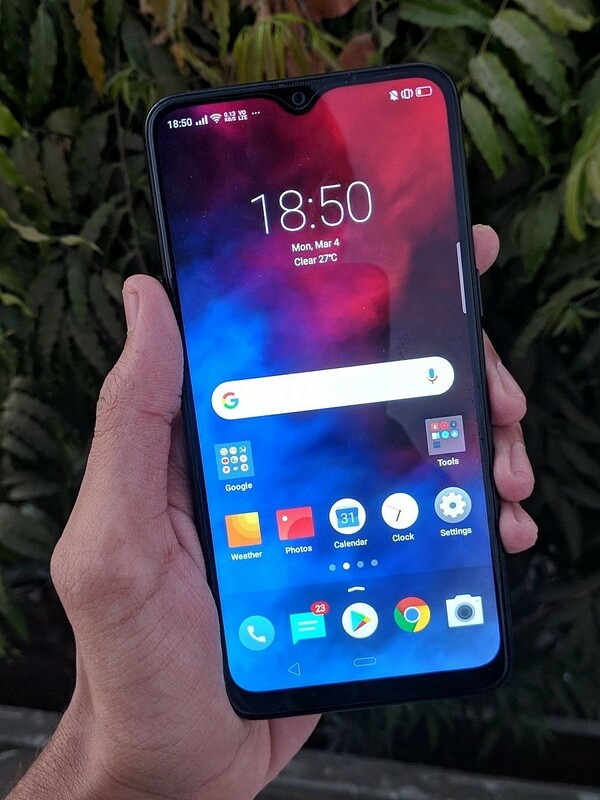 Whether the upcoming Realme 3 Pro will prove to be a serious competitor to the Redmi Note 7 Pro, we’ll find out in the next few weeks.